Northeast Saskatchewan is home to many talented artists. Today’s spotlight is on one of those artists who not only constantly provides us with beautiful works of art in many mediums, but who is also a role model and mentor to anyone who needs it through her inspirational workshops and galleries and even through her contagious enthusiasm for exploring the artist within herself and encouraging all those around her to do the same. Lori Bradford grew up in Prince Albert, SK where she lived for over 40 years. While living in Prince Albert, Lori grew and dried flowers, and sold at many craft markets in the 1980 and 90’s. As the owner and operator of Prairie Shadows Craft Barn just north of Prince Albert, Lori taught a lot of classes to aspiring artists, including wheat weaving, dried flower arranging, making wreaths and swags. 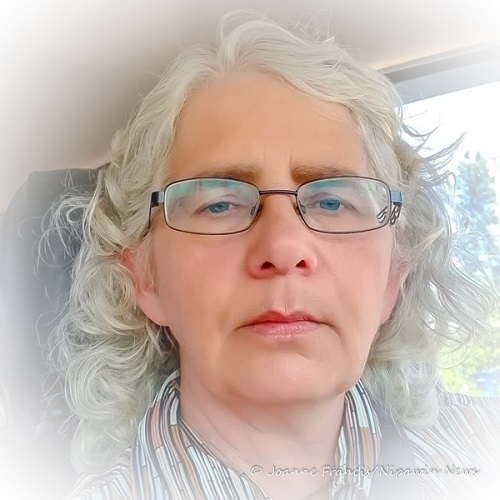 Active in many aspects of the art community there, she was a member of the Home Based Business Association and the Dried Flower Association as well as a member of the Prince Albert Arts Council for quite a few years. Lori’s children are all grown and living across Saskatchewan but cannot stay away and come to see Lori and Bernie with weekly visits. Lori Bradford’s Art is currently on display at the Nipawin Art Gallery in the Nipawin Library. Lori will be hosting Artist Reception for Whimsical and Colourful Artfulness at the gallery on Saturday September 23rd, from 2:00 pm – 5:00 pm. Everyone is welcome to come and view her art, meet Lori, or simply be inspired by the works she has created over the past 4 or 5 years, since moving to Nipawin. If you can’t make the reception, you can still view Lori’s solo show at the Nipawin Art gallery for the month of September. I take as many art classes as I can both in person and on-line. Learn as much as I can from each and then take the things I learned and attempt to make it my own. I have always been creative. Over the years have been a wheat weaver, dried flower grower and arranger, did mosaic art, and finally settled into painting. I keep trying new things though and also do fabric art, paint signs for my garden, sew, make jewelry, make my own art journals and lately have been attempting collage art. I have a beautiful studio full to the brim with art supplies of every kind. I try and create everyday. If I don’t, I have a tough time getting started again. Like writers block I can get Artist block. But if I can at least doodle I can keep my creative juices flowing and keep that from happening. I am always inspired by my art students. I love teaching and sharing what I know. I have been teaching art for over 30 years. Kids to seniors. My favorite students are the ones that have never picked up a brush or pen or think they can’t make art and then are so amazed with what they made with a few hours of lessons. 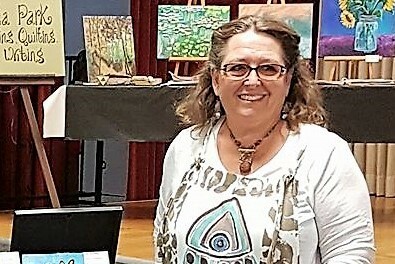 My web page, www.loribradfordsart.com shows some of the classes I teach and anyone interested in lessons just needs to contact me, we will find a time that works for all of us and I will arrange for private or semi private classes. It’s always more fun when 2 or 3 friends get together and come. They have a good time, learn as much as I can fill into their heads and go home with something they created and can be proud of. I will be travelling to schools in Pinehouse, Creighton, Prince Albert and Duck Lake with Saskatchewan Culture Exchange for the month of October teaching art to students from grades k to 12. Then in November I will be teaching in Texas. The ZenPen drawings are my way of relaxing. It’s almost like a form of meditation. Many hours and many pens were emptied making those drawings but they were and are a wonderful way for me to relax. All I need in a piece of paper and a pen. The Fantasy forest floors paintings are an extension of my ZenPen drawing but with watercolor added. I don’t always use watercolor paint though. I also use Inktense pencils or ink. No washed out muted colors for me. I want vivid, bold and bright. The Fantasy forest floors paintings are an extension of my ZenPen drawing but with watercolor added. I don’t always use watercolor paint though. I also use Inktense pencils or ink. No washed out muted colors for me. I want vivid, bold and bright. The fish happened during teaching mixed media classes. In order not to overwhelm my students by trying to draw something “tough” while learning the methods of mixed media art I had them draw a feather. The fish happened during teaching mixed media classes. In order not to overwhelm my students by trying to draw something “tough” while learning the methods of mixed media art I had them draw a feather. Feathers are simple and that class was very popular so I ended up painting a lot of them. I get bored easy though and feathers just were not holding my attention. Then I turned a canvas sideways and saw a fish or at least a shape that could be a fish. I added fins, lips, eyes and the fish started swimming onto my canvases. My fish painting all have lots of colour and patterns. They have a personality. They make me happy and honestly what more should a painting do than make you happy when you look at it? I sometimes just like to muck around with my paint and play with colour combinations. I end up with dozens of sheets of paper all beautifully printed and then need to find something to do with them so I use those hand-printed papers for my collage. I will print on old book pages, maps, deli paper and recycled paper. Nothing is safe! Collage isn’t just about cutting up paper and gluing it down, I also paint, draw patterns and add embellishments. I’m still exploring this art form. There are a lot of sunflower and daisy paintings in this show. There is a reason for that. I live in what I have heard called the “sand flats’ or jack pine sand, no dirt here at all, but sunflowers grow and so do daisies so that is what I paint. Paint what you know and paint it in as many ways as you can. Explore as many mediums as you can, try different styles of painting and soon you will find your own artist voice. Nipawin Lions Craft & Gift Show Happening is Right Now!